High-end web design, Miami Website Design, Custom Website Design, Professional Web Design, Web Design Enterprise offers only high-end, custom make, web design, if you are looking for a website that works and attract customer to your business we are the right match. We pride ourselves in being a non-template company. All of our websites start off as a Photoshop file, every single one of our designs is custom made, and we will never use a web design template for any of our designs. 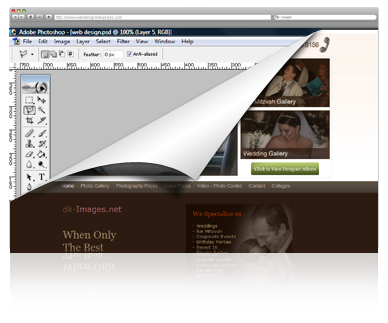 The web design portion is the graphical part of the website development of your site. Our Graphic artists and designers work together to come up with ideas and different concepts based on the customer's specific requests and our own marketing research is here to guarantee the success of our client's website. Once the website design is done our web developers team will complete the coding portion of the site. Every website design begins with an idea. Our web design team is extremely creative, most of our clients come to us with no idea of what they want their websites to looks like, this is where we work with any concept our clients bring or we can start our own brainstorming session and come up with the winning combination for your business. We want your experience to be smooth and stress free, we are here to do the work for you. The big differences between our high-end web design services and other web design companies. What keeps Web Design Enterprise on the top? Web Design Enterprise is an American Owned and Operated company that understands the basis of online business and web presence. We are always available, any time, any day. Our staff is always ready to work for you, therefore we will always be a web designer or web developer here to answer your questions and work with you in whatever your web design needs are. Customer relationship is the most important thing for our company. Let's face it, your clients have busy schedules, busy lives, they can't be wasting time browsing for a specific item or portion of your site. If your client assumes a product or service is not available they will look elsewhere. We will make sure your layout provides a very ease navigation to your customers and help them find what they are looking for, preventing them from having to look anywhere else. Your design will be unique and will make you stand out from your competitors. Your clients will be impressed by your web site and the presentation of your products/services. We do NOT use templates or designs created for other people, our in-house web design team will create every design concept from scratch for every project. Before the materialization of any idea or concept we do a market research based on your company profile, this process will reveal ways for us to improve our customer's online experience and take them up-front of their competition. We make sure your design will attract and expand your client base. We are the only company in the United States, among other countries, that guarantee the appearance and satisfaction of your website. This means our customers have unlimited revisions. You may change your site design as many times as necessary until the perfect product is achieved. There is no extra charge. Once a price is set, it cannot be changed, we will never ask our clients for more money in the middle of the project, or came out with excuses to charge more. Every project price is guaranteed in writing by a professional web design contract. We look forward to working with you. Get your free web design consultation today, our professional web designers, graphic artists and web developers are here waiting for your call.